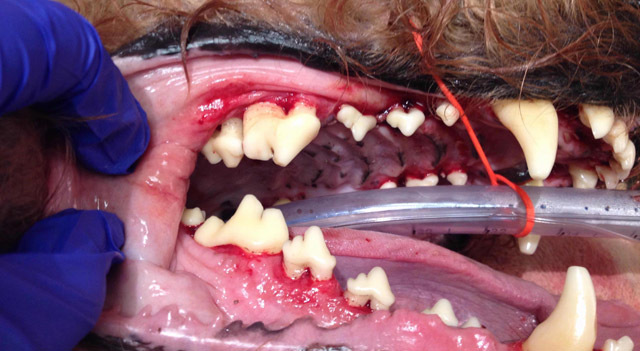 Did you know that dogs and cats develop tartar and periodontal disease just like we do? According to the American Veterinary Dental Society, dental disease is the number 1 health issue seen in 70% of cats and 80% of dogs, over the age of three. 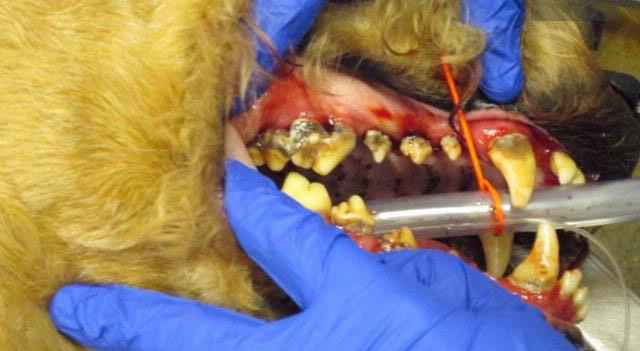 Just like in humans, animals develop tartar and disease at different rates and because of this; some animals may need dental cleaning (dental prophylaxis) and/or extractions annually, while others may only require cleaning once or twice in their lifetimes. Brushing your pet’s teeth with pet specific formulated toothpastes, using preventatives such as water additives, feeding a special diet or giving your pet specially designed toys and chews are all ways to help reduce the risk of periodontal disease. In spite all best efforts; some pets will develop dental issues. Symptoms associated with periodontal disease can include oral pain tooth loss, difficulty eating, weight loss and bad breath. Left untreated, serious complications such as inflammation and infection can occur. Bacteria from an infection can enter the bloodstream and affect other organs such as the liver, kidneys and the heart. This scenario can be especially concerning in older animals. These animals can often be immune-suppressed and therefore less capable of clearing the bacterial from their bloodstream that enter through the inflamed gum tissue. Additionally, older animals are those which suffer the highest incidence of dental problems. Our veterinarians perform an oral examination on your pet as part of an annual physical. They assess your pet’s oral health based on the level of tarter, inflammation or disease and make recommendations regarding the oral care that you pet requires. For several reasons, dental prophylaxis procedures are done under general anesthesia. In addition to the benefit of being able to physically perform the procedures, this method of anesthesia protects your pet from inhaling aerosolized bacteria, which could cause pneumonia. 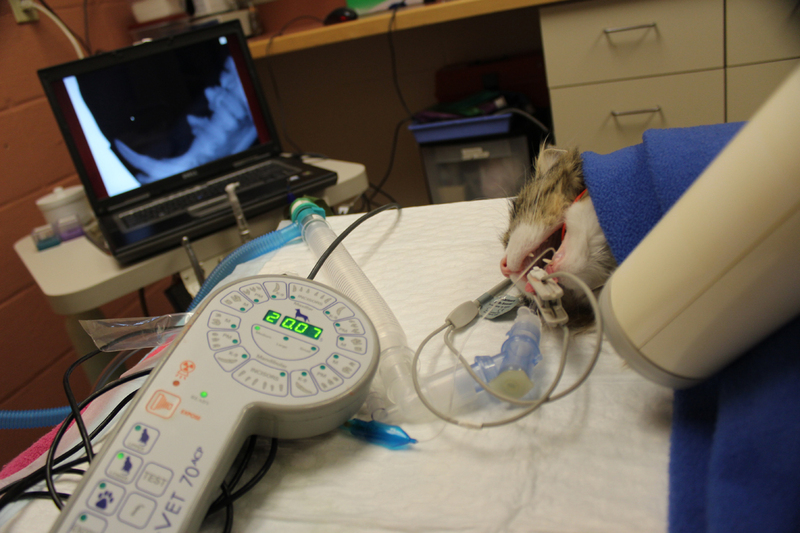 While many owners have concerns of general anesthesia, the risk can be lower than that of progressive oral disease. Proper oral health is important to your pet’s overall wellbeing. 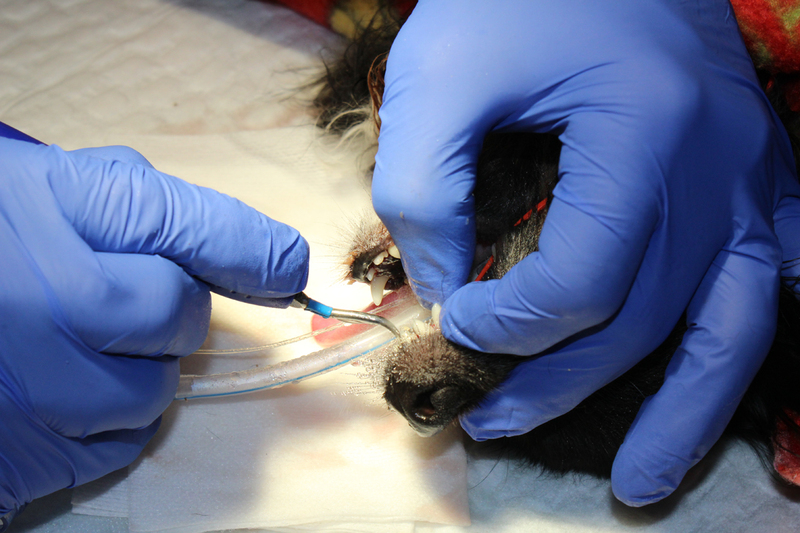 Ask your veterinarian what you can do to help prevent dental disease in your pet.